Just a real brief update on whats going on. 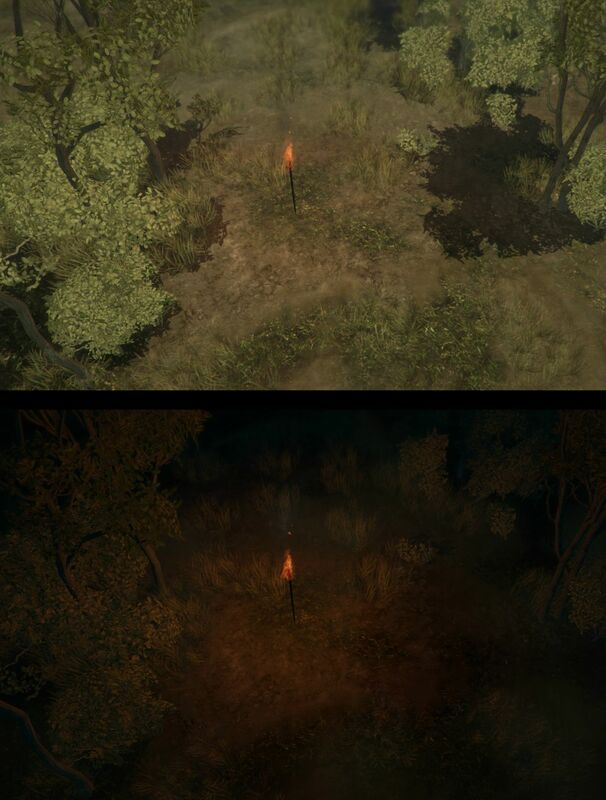 I spent the last day or so trying to dial in the day/night cycle as well as experimenting with different types of foliage for the environment. 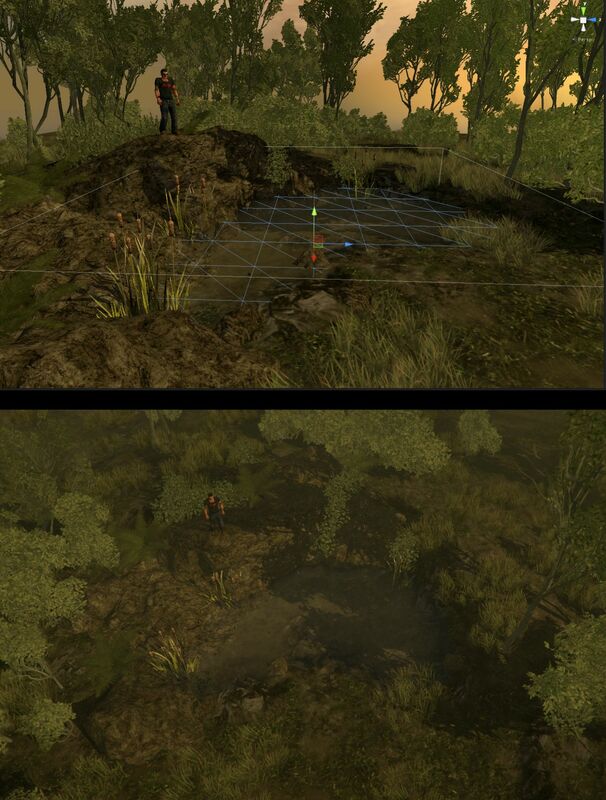 The biggest switch was going from a mesh terrain (a flat box) to actual terrain with slight variations in height and more control over the ground textures. The main reason I stuck with a mesh terrain for so long was my worry about the world tiles showing up as tiled and my worry about integrating varied height in the tile based world generator we have set up. Personally the tiling breaks my immersion in some games when I can recognize patterns. The image below is an example of where 4 tiles meet. I cant see any seams! Another "first implementation" : Water. I've added the very first small pond to the world. The purpose it serves is to provide dirty, contaminated water that you should probably filter and purify before drinking. It looks a little murky. The ponds will also be an active area for animals. Thats right, hunting. We are really close (couple of days) to implementing the first AI and then we'll get some zombies/critters running around in the world. That, plus the recently added combat system should provide some interesting results. Speaking of the combat system, I went through and removed the other two targeting systems so now it is strictly free-aim. Doing that alone really made things feel a lot smoother. I'm pretty sure the 3 were conflicting with each other at the time of the video. I also went through and smoothed the gun play a bit so it isn't so choppy. Its coming along, slowly but surely! Max Aller, kellian1, and 33 more people like this update. This is looking really great, thanks for the update! Truly thou art a magical wizard. Nice work on the texture connections, looks awesome. Game is really coming along; thanks once again for keeping us in the loop - loving these short, regular updates.